Say the name, “Tom Brady,” and the first thing that comes to mind is football. But the star quarterback has another passion. “I could talk food all day. I love good food” the four-time Super Bowl MVP exclaims. Brady clearly relishes tasty meals, but he’s also keenly interested in the foods that fuel optimal health, stamina and resilience. In fact, the 40-year-old NFL legend has attracted a great deal of interest for his vegan-style diet, which he credits for keeping him in better shape than competitors half his age. Recently, Tom Brady was on ABC’s Good Morning America to talk about what it takes to be at the top of your game, the importance of family, his narrow Super Bowl loss to the Philadelphia Eagles and his possible retirement. But it is clear that the New England QB believes his dietary and exercise regimen could keep in the game for another five years (or more). How does he do it? Here’s a look at the TB method. How does Brady achieve his high-performance? The football star credits a “holistic regimen” that includes some lifestyle choices you might not expect from an NFL player (including a vegan-style diet). He claims this method keeps him lean, energized and extremely pliable, which helps him face challenges both on and off the field. What’s behind the TB12 method, as Brady calls it? And how can you benefit from the dietary and lifestyle habits he advocates? Let’s have a look the difference his plant-based and organic outlook can have when it comes to your health and well-being. As you can see from the tale of the tape, Brady’s diet is largely plant-based, which makes it both nutrient and fiber-rich. The New England quarterback is a huge advocate of eating as much organic, locally grown and seasonal food as you can. He believes that most of the produce that ends up on supermarket shelves is nutrient deprived because it has been grown in depleted soil and stored for months before being shipped. The father of medicine, Hippocrates, said: “Let food be thy medicine.” That’s certainly the attitude Brady takes. He insists that good nutrition is critical to keeping muscles both healthy and capable of peak performance at all times. For him, that means avoiding inflammatory foods, which will only compound the natural muscle inflammation that occurs during his personal training and on game day. Brady’s diet is similar to the so-called Mediterranean diet (in the way it emphasizes plant-based foods with only modest amounts of animal protein), but it is also a little more complex because he tries to avoid nightshade vegetables altogether and achieve a balance of 80 percent alkaline foods to 20 percent acidic foods. That’s because Brady believes too many acidic foods produce a condition known as acidosis, which can lead to fatigue, muscle soreness, vulnerability to infections and mood swings. Getting an 80/20 mix, Brady insists helps keep the body oxygenated, which promotes recovery and healing. The average football fan consumes more than 1,500 calories and at least 50 grams of fat during a typical gameday munch. But nutritionists say many tailgaters may consume closer to 6,000 calories or more in a single afternoon. As you can see from the typical game day menu above, many fans are loading up on artery-clogging trans fats that will increase their risk of cardiovascular disease and many cancers too. 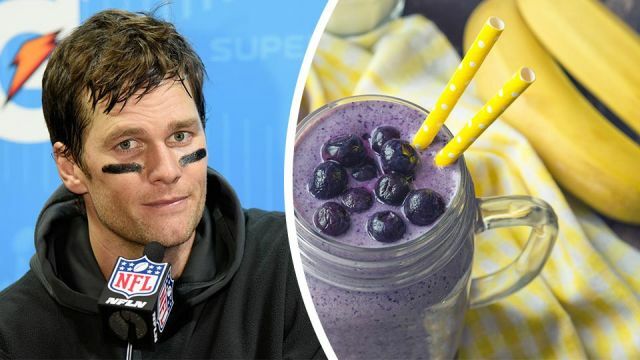 Tom Brady tries to avoid refined carbs and non-fruit sugars because they raise blood glucose levels and promote inflammation — the enemies of athletes. He admits to having the occasional beer, but he generally avoids alcohol because it is loaded with sugar and is dehydrating. If he does have a beer, he makes sure to have three glasses of water to compensate for fluid loss. Is Brady’s diet the key to his success? Tom Brady’s fitness regimen has generated a little controversy. Some question his aversion the nightshade vegetables like tomatoes (which most nutritionists heartily recommend). But there’s no denying that Brady’s approach, which aims at creating the right mix of “strength, conditioning, and flexibility” through nutrition and exercise has worked for him. After all, he’s won a record-breaking five Super Bowl Championship while leading his team to the big game eight times. Indeed, numerous sports figures and nutrition experts believe his diet could help extend the lives and careers of many athletes. There’s a lot of fans who could probably beat obesity, diabetes and cardiovascular disease by borrowing a page from Brady’s dietary playbook. Hey Buddy!, I found this information for you: "This Is What Five-Time Super Bowl Champion Tom Brady Eats For Breakfast". Here is the website link: https://www.thealternativedaily.com/this-is-what-super-bowl-champion-tom-brady-eats-for-breakfast/. Thank you.